For Jim, the early October Mid-Atlantic Arts Foundation On Screen/In Person tour proved every bit as exciting as EGM’s late September Global Voices of Nonviolence kickoff from Washington D.C. If anything, the ten-day, eight-venue, four-state schedule proved much more demanding. Before hitting the road, Jim was interviewed by the tour hosts (click here to listen to the interview). 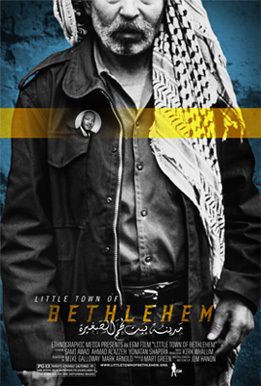 Each stop on the tour included a public screening of Little Town of Bethlehem and a post-screening discussion with Hanon. Below is the tour schedule, interspersed with some observations and Jim’s personal thoughts about the experience. Not only did Jim have the opportunity to talk with students after the screening at Mercyhurst College, he also had the privilege of speaking in some of the classrooms about the Israeli-Palestinian nonviolence movement. Michael Fuhrman, director of the Mary D’Angelo Performing Arts Center at Mercyhurst, interviewed Jim while he was there. Rutgers University has three campuses. The film was screened on the New Brunswick Campus and hosted by the Department of Latino and Hispanic Caribbean Studies. Much of the post-screening discussion focused on nonviolence in the larger, global context. There were African-American students who wanted to talk about the equality issue, and Latino students who wanted to talk about the similarities of the cycle of violence in gangs. And many in the audience wanted to talk about the Arab Spring and the current Occupy Wall Street movement. Yet, all of the questions kept feeding back to what the media reports and why. What information the public does and doesn’t receive kind of became a central thread in the discussion after the film. Once again, the audience confirmed that Little Town of Bethlehem shared things they simply hadn’t heard before. Powerful things. Whenever people discover there is more to the story it is a natural response for them to ask why they didn’t know. The symphony hall in Allentown, which once played host to Bob Hope years ago, hosted this stop on the On Screen/In Person Tour. Unlike the college and university stops, this audience was older. Many of them remember the 1960′s U.S. civil rights movement, and some questioned the appropriateness of the comparison to the Israeli-Palestinian conflict. Monmouth University in West Long Branch, New Jersey has a reputation for its work with interfaith dialog, especially between Jews, Muslims, and Christians. Many professors brought their classes to the screening, making it the largest audience at that point of the tour. In 2007, when we started the journey of making the film, I’m not sure how many community efforts like the one in Monmouth existed. It was great to see that our telling the story in Little Town of Bethlehem was simply part of a larger picture. Everyone stayed at the conclusion of the film in Frederick, Maryland, to hear what Jim had to say. The discussion at the beautifully renovated Weinberg Center focused on what was being done to help the young people in the region avoid being indoctrinated into the conflict. The audience understood that the older generations tended to hold on to the conflict because of their trauma, but the younger generations tended to be more open to knowing the other side, and were inclined to believe that it could be different. Remembering the holocaust is essential, and I devoted a good portion of the film to it. But there are two ways to remember it: One that creates fear and self survival and one that creates compassion for others whose survival is also threatened. How much of each way do we pass on to our children? This isn’t a question for just Israelis and Palestinians; it is a question for us all. Not far from Washington D.C., stands a new memorial to Dr. Martin Luther King, Jr. During the screening, some expressed doubt that any progress toward peace could be achieved without the involvement of those in power. You have to be grateful that Dr. King never left equality in the hands of the politicians of his day. The non-violence movement put pressure on the political process to listen to the admonitions of humanity. On the final night of the tour, Little Town of Bethlehem screened to a packed auditorium. And as often is the case, various faith traditions were represented in the audience. Tonight at St. Peter’s I saw a diverse community come together and share in this one experience—only to later share their unique experiences with each other. It reminded me of one night of filming at the Church of the Nativity in Bethlehem. It was there that I saw both Israelis and Palestinians treating one another as human.